When spraying paint or coatings onto a surface, or fertilizers or pesticides onto crops, the size of the droplets makes a big difference. Bigger drops will drift less in the wind, allowing them to strike their intended targets more accurately, but smaller droplets are more likely to stick when they land instead of bouncing off. Now, a team of MIT researchers has found a way to balance those properties and get the best of both — sprays that don’t drift too far but provide tiny droplets to stick to the surface. The team accomplished this in a surprisingly simple way, by placing a fine mesh in between the spray and the intended target to break up droplets into ones that are only one-thousandth as big. The findings are reported today in the journal Physical Review Fluids, in a paper by MIT associate professor of mechanical engineering Kripa Varanasi, former postdoc Dan Soto, graduate student Henri-Louis Girard, and three others at MIT and at CNRS in Paris. Earlier work by Varanasi and his team had focused on ways to get the droplets to stick more effectively to the surfaces they strike rather than bouncing away. The new study focuses on the other end of the problem — how to get the droplets to reach the surface in the first place. Varanasi explains that typically less that 5 percent of sprayed liquids actually stick to their intended targets; of the 95 percent or more that gets wasted, about half is lost to drift and never even gets there, and the other half bounces away. Atomizers — devices that can spray liquids in the form of droplets so small that they remain suspended in air rather than settling out — are crucial parts of many industrial processes, including painting and coating, spraying fuel into engines or water into cooling towers, and printing with fine droplets of ink. 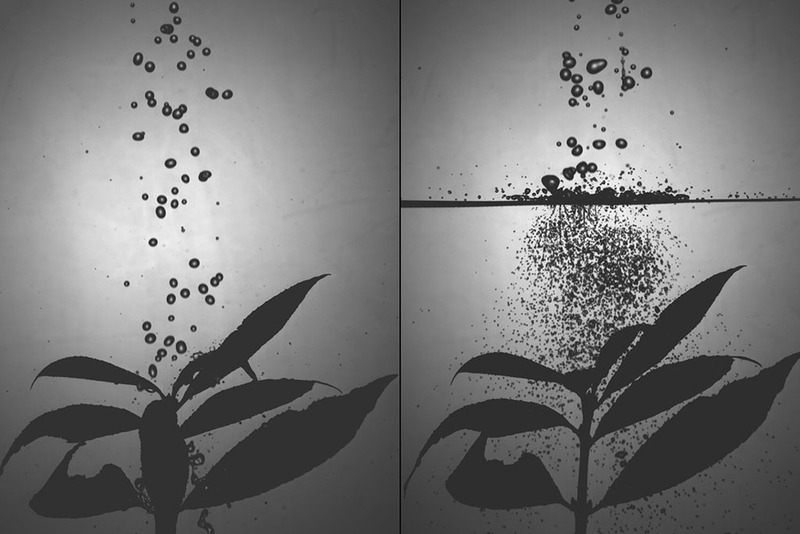 The new advance developed by this team was to make the initial spray in the form of larger drops, which are much less affected by breezes and more likely to reach their targets, and then to create the much finer droplets just before they reach the surface, by placing a mesh screen in between. Though the process could apply to many different spraying applications, “the big motivation is agriculture,” Varanasi says. The runoff of pesticides that miss their target and fall on the ground can be a significant cause of pollution and a waste of the expensive chemicals. What’s more, the impact of finer droplets is less likely to damage or weaken certain plants. Farmers already cover some kinds of crops with fabric meshes, to protect against birds and insects devouring the plants, so the process is already familiar and widely used. Many kinds of mesh materials would work, the researchers say — what matters is the size of the openings in the mesh and the material’s thickness, parameters the team has precisely quantified through a series of lab experiments and mathematical analysis. For their experiments, the researchers primarily used a commonly available and inexpensive fine stainless steel mesh. The researchers propose that, after deploying the mesh over the crop, either directly supported by the plant stalks or supported on a framework, a farmer could simply use a conventional sprayer that produces larger drops, which would stay on course even in breezy conditions. Then, as the drops reach the plants, they would be broken up by the mesh into fine droplets, each about a tenth of a millimeter across, which would greatly increase their chances of sticking. As an extra bonus, the presence of the mesh over the crops could also protect them from damage from rainstorms, by also breaking up the raindrops into smaller droplets that place less stress on the plant when they strike. Crop damage from storms, which can seriously reduce yields in some cases, may be reduced in the process, the researchers say. In addition, bigger drops cause more splashing, which can lead to a spread of pathogens. The same principle could be applied to other uses, Girard points out, such as the spraying of water into cooling towers such as those used for electric power plants and many industrial or chemical plants. Using a mesh below the spray heads in such towers “can create finer droplets, which evaporate faster and provide better cooling,” he says. Cooling efficiency is related to the drop’s surface area, which is three orders of magnitude greater with the finer droplets, he says. In recent work, Varanasi and his team found a way to recover much of the water that gets lost to evaporation from such cooling towers, by using a different kind of mesh over the towers’ top. The new finding could be combined with that method, thus improving power plant efficiency on both the input and output sides. For painting and for applying other kinds of coatings, the finer the droplets are, the better they cover and adhere, Girard says, so the process could improve the quality and durability of the coatings. The team included Antoine Le Helloco, and Thomas Binder at MIT and David Quere at CNRS in Paris. The work was supported by the MIT-France program.